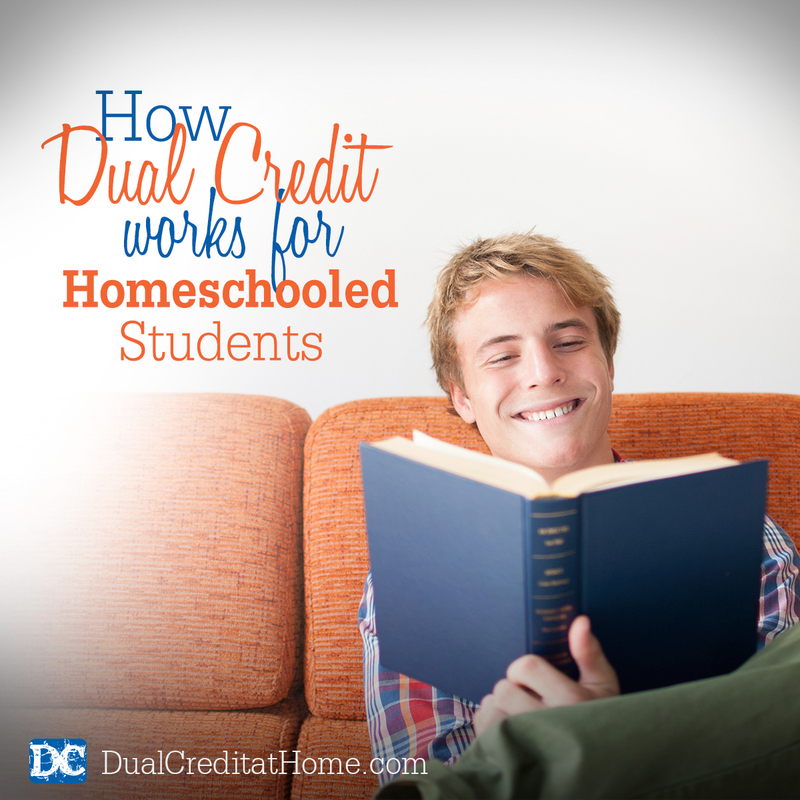 Have you ever wondered how homeschooled students can earn dual credit in high school? As a homeschool mom who has taken advantage of dual credit studies in our high school at home for several years, I’d like to share with you exactly how dual credit works so you can decide if and how to implement it in your own homeschool. The term “dual credit” may be unfamiliar to some of you. “Dual credit” simply means your student is awarded both high school and college credit for the same course. Dual credit can help your student complete their degree in less time because they’ve already accumulated many of the needed credits during high school. Many core college subjects (history, math, science, English, government, etc.) are simply repeats of high school subjects. This means your student is going to take history in high school and then pay to take history again in college. The same for math, science, government, English, etc. This isn’t necessary! High school is the ideal time for students to earn college credits for these core subjects. • It’s a two-for-one deal – one subject can get dual credit. • A one semester college course (or an exam) is equal to a one year high school course. • Your student builds an academic track record, proving that he’s capable of college-level work. • Your student can spread his college credits out over additional years, lightening his course load later. • Dual enrollment courses/exams are taken while your child lives at home, so you can play an active role in helping him respond to different worldviews. • Students learn valuable skills such as managing time, planning a schedule, prioritizing deadlines, etc. • Dual credit studies are impressive on a high school transcript. • Dual credit studies can help you avoid a just-get-by mentality during high school. Talk with your teen about their career plans. Do they know what they want to do after high school? Is college needed for their particular life purpose? A college degree might not be needed, but a college-level education is always a good thing. One of the great benefits of home education is that “high school” studies can be done at a higher level even if a college degree isn’t the goal. Earning dual credit also reduces the amount of money spent on college (tuition, books, room, board, etc.) in several ways. Students can take a college-level exam instead of a class and receive the exact same credits as the students attending class – and exams cost less than classes! Also, colleges charge less for classes taken as a dual credit student than they charge high school graduates for taking the exact same class. And, of course, living at home while earning college credit is cheaper than living on-campus. The exact amount of money saved depends on how your student earns dual credits (exams or classes) and which college/university they plan to attend. Realizing how much money you’ll save is great motivation for deciding to let your high school student get as many of their college credits earned as they can WHILE they are finishing high school. There are three ways students can earn dual credit. One way is to take an on-campus class (usually at a junior college) during high school and then transfer those credits to the four-year college/university of their choice. It’s very important that you understand which courses will transfer successfully, and you do that by checking the website (it may even take a phone call) of the college/university which will be receiving the credits. A second way is to take an online class from any accredited college and then ask that college to send their transcript to the four-year school. The four-year school will evaluate that incoming transcript and apply the appropriate credits to their degree plan. Again, make certain that the credits they earn will successfully transfer. The third way to earn dual credit is to take and pass a college-level exam (e.g. CLEP, DSST, etc.). Their passing score earns them exactly the same credits as students who paid for (at the college price) and attended that class throughout the entire semester! College-level exams, created for the purpose of awarding credit for “prior college-level knowledge,” cost even less than dual credit classes – costing about $87 plus a small testing center fee and taking 1½ hours of test time. “Prior college-level knowledge” simply means knowledge acquired prior to test time. A student can study a subject at home, go to a testing center and take the exam, and receive the same credits for it as the students who paid full price and spent the semester in the classroom. Students as young as thirteen years old can begin taking college-level exams. There are also no restrictions on how many exams can be taken (and thus credits earned) in any period of time. As parents consider these three options, generally these questions come up . . . Your student is awarded the high school credits by you when they complete the on-campus class, the online class, or study a subject for a college-level exam. You simply list that subject, the grade, and the credits earned on their high school transcript. When your student enrolls at a college to take a dual credit course (on-campus or online), that college creates a college transcript for them. It is a blank transcript at first, and each time your student takes a course the college adds it to that transcript. For college-level exams, it’s a slightly different credit awarding process – but still easy. Let’s say your student takes and passes a CLEP exam. That passing score is kept by the testing agency (in this case it’s CollegeBoard) until you request they send your student’s test transcript to a particular college/university. This is generally referred to as “banking” credits. Once a college/university receives your student’s test transcript, they evaluate it and officially award the credits by placing them on your student’s college transcript. You may let your student bank as many credits as you’d like by having them take several exams over a period of time (generally, students test when they complete the study of a subject). Want to see how this works in real life? Discover how your teen can use dual credit to earn an accredited degree during high school by attending my free online workshop! More and more students are opting to earn dual credits through credit-by-exam, as it is one of the most economical and time-saving methods of earning an accredited bachelor’s degree. Best of all, you can complete an entire degree program from HOME, saving you thousands and thousands of dollars in room and board. Students as young as 13 can begin to accumulate exam credits toward the degree they will eventually pursue. Our program, Dual Credit at Home, helps eliminate the stress and guesswork of creating your own course of action. Our Study Plans will guide your student through 13 college-level exams to satisfy both high school and college core requirements. These exams give students the opportunity to earn up to 51 college credits!